Jakarta, INDONESIA. It was sent to Steve Waller from Flat Rock, MI. I thought it was excellent and permission was attached to use it, so it is my pleasure to share that which is good with those who come by here. What Does It Mean To Obey The Gospel? denominational churches add or subtract from the gospel of Christ. creeds which include the doctrines of men (Matt. 15:8,9). because they were not correctly told how to be saved from their sins. Some preachers may omit this doctrine out of ignorance. to the Bible he has condemned himself and those who hear him (Gal. does not agree with their cherished yet false doctrines. not obey the gospel will be lost. on those who do not obey the gospel of our Lord Jesus Christ” (NKJV). gospel obedience to be saved and become a Christian. 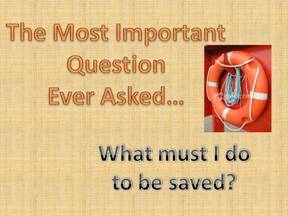 are necessary to obtain salvation. One of the most obvious requirements is faith (Heb. 11:6). confess his faith in Jesus as the Son of God (1 Tim. 6:12; cf. Heb. made unto salvation.” The preposition unto means leading up to a point. resurrection of Jesus Christ” (KJV). What could be plainer than that? not precede baptism; it comes afterward.